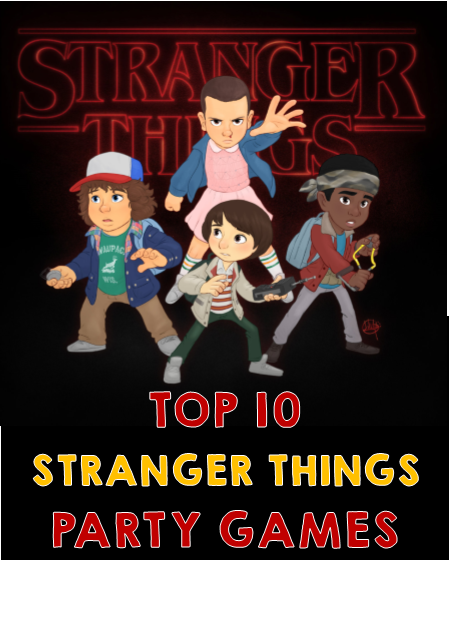 Our Stranger Things party games and ideas will surely help inspire you to throw the raddest party this side of the 80's. Our games are a mix of D.I.Y ideas and exclusive printables created just for a S.T party. 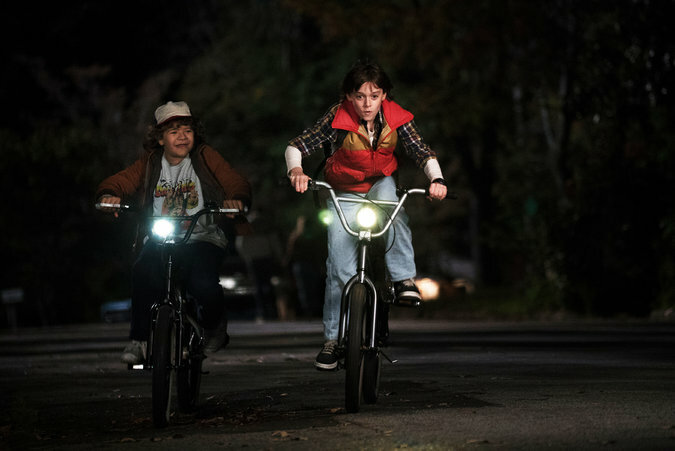 This might take a bit of elbow grease and creativity, but a demogorgon pinata is a great addition to a Stranger Things themed event. You can start with a pre-made basic circle pinata in and use paper-mache and other crafty stuff to turn it into a demogorgon creature. Fill it with treats and have guests take turns bashing it with a bat until it bust open and releases all it's goodies. 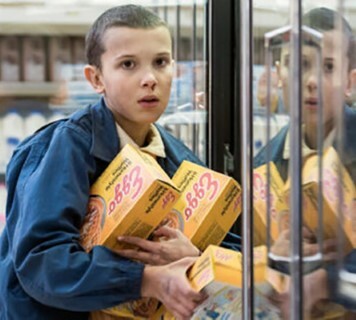 In honor of Eleven's favorite food why not have an Eggo eating contest. Give each participant a plate with 5 eggo's on it, with butter and syrup on top. Have them sit around the table and keep their hands behind their back, on the start of go players dive face first into their plates and race to be the first to eat all of their Eggo's. The first player to clear their plate of all waffle remnants claims victory! 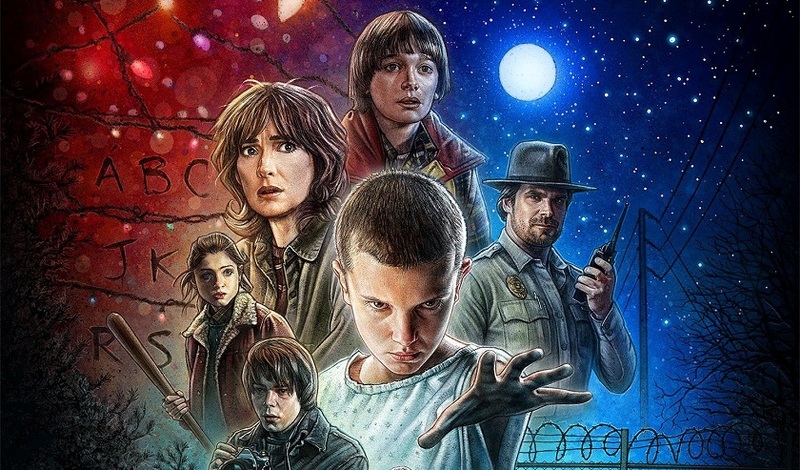 Our exclusive Stranger Things trivia treasure hunt will MAKE your party. 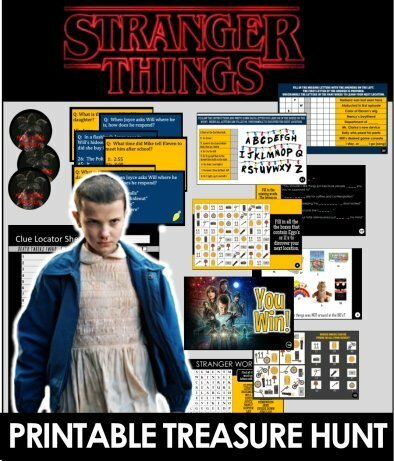 This printable hunt features printable clues of brain teasers, trivia, and puzzles that players must figure out in order to get from one clue location to the next. The final clue leads to the treasure of your choice. One of the best features of this hunt is that YOU decide the hiding locations of the clues, which means you can play ANYWHERE! 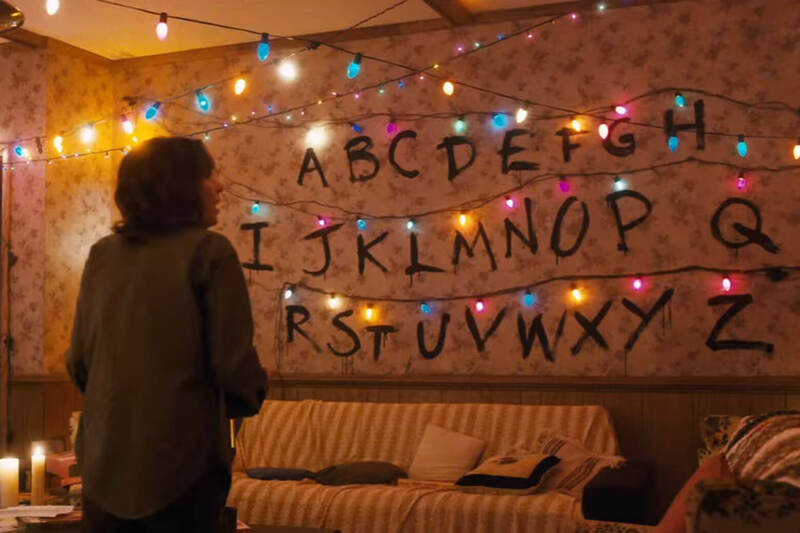 Use a wall in your house to recreate Joyce's Christmas light communication board. Make sure you get the lights that when one light is out the rest still light up. Decide on a simple two or three word message and unscrew all the bulbs (just enough where they don't light up) from letters that do not appear in the message. Draw out blanks (hangman style) on a dry erase board so that players know how many letters are in each word, and the order of the words. If you think the message may be too hard you can write in a few letters as freebies. Give each guests a paper and pen. They must try and determine what the message is using the Christmas lights to tell them what letters are used. The first player to guess the message correctly wins. If you like they can then create a message to be guessed. Continue playing for as many rounds as you like. 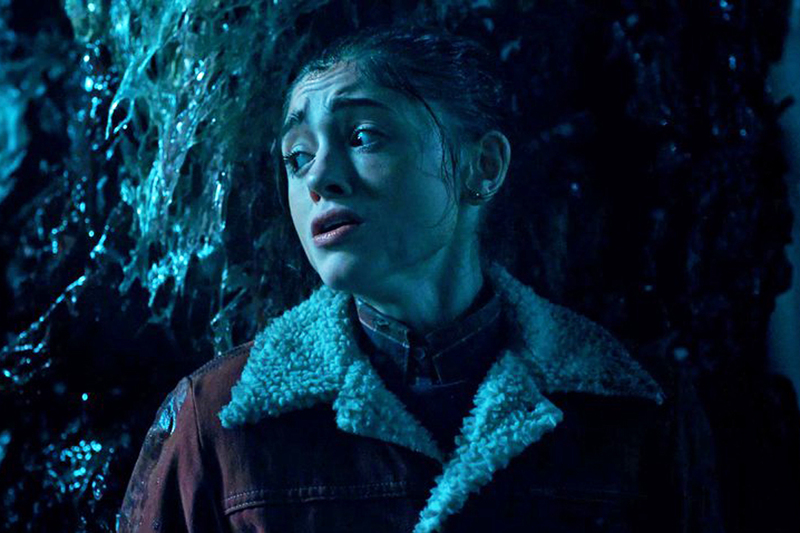 When Nancy ventured into the Upside Down, the Monster was unaware of her presence until she made noise. In this game one player is blindfolded, they play the demogorgon. They must try and search out other players on sound and feel alone. Once the player is blindfolded, the rest of the players hide somewhere in the playing area. The demogorgon player must then try to find them by feel around and listening. 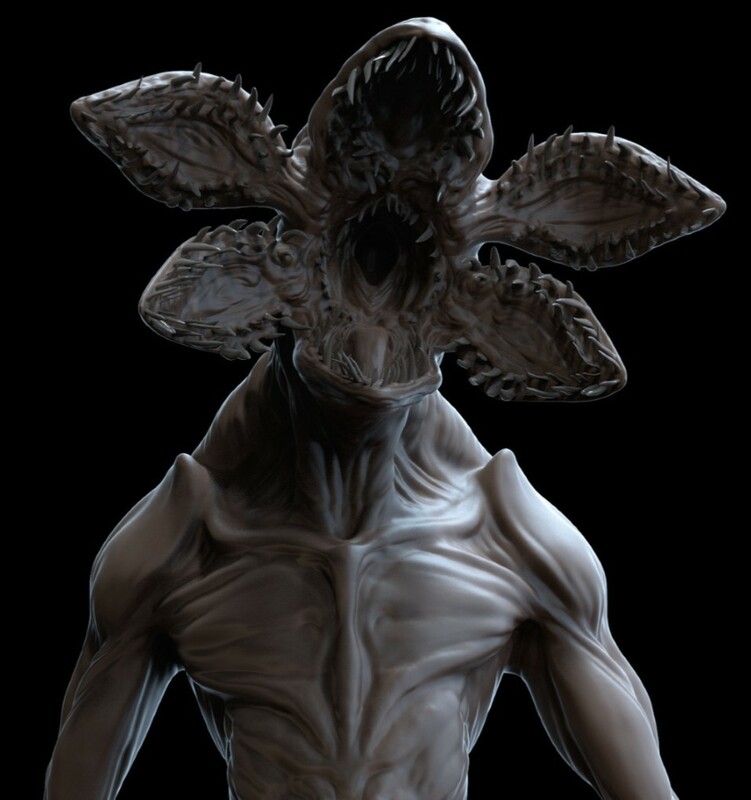 The demogorgon player can call for a clap up to three times during their turn. At this point all the others players who haven't been found must clap loudly two times. When a player gets caught (touched) they are out. The last player to be found wins. Rules for hiders are that they must be accessible, and that once they find their hiding place they must keep one foot planted the entire round. 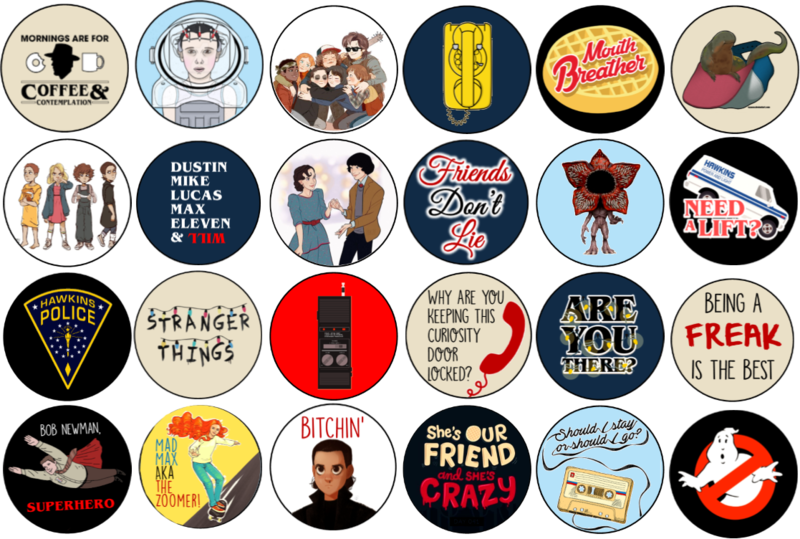 Collect 15-20 of your favorite quotes from the show and write them on note-cards. Players must try and guess who said what. The first person to guess each quote correctly wins that card. The player that wins the most wins the game. An alternative is to remove a specific word from each quote and instead of having players guess who said it, have them try and guess the missing word. 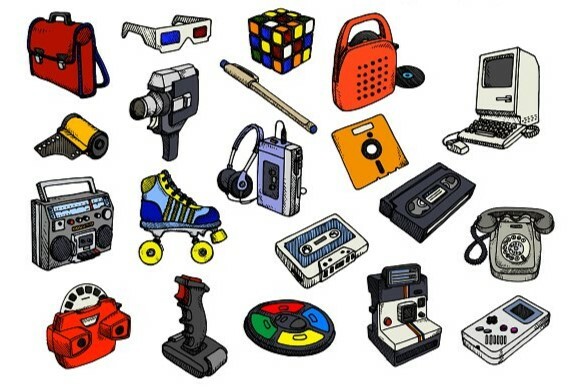 Collect a variety of 10-15 items from the 80's and 90's. This can be movies, toys, objects, songs. Have them all sitting together. Each player is given a turn to sort through the objects separating all the items that were around in the 80's from those that came after. Give players 1-2 minutes to sort. Write down each players total objects correctly, but don't reveal that until everyone has had a chance to play. The player with the most correct answers wins! 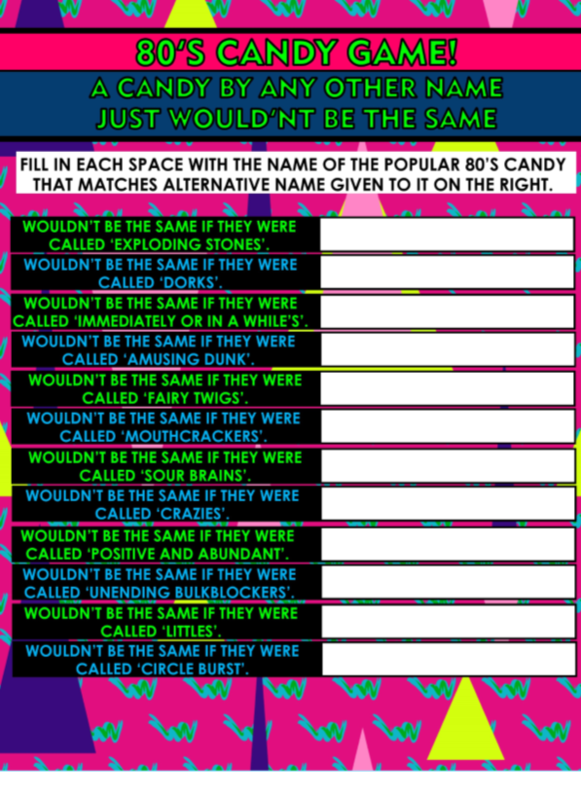 Our printable Candy Name Game challenges your guests to remember their favorite 80's candy with a fun word play challenge. Would a candy by any other name taste the same? I don't know about that, but your guest will be given an alternative name to 12 different candies and must come up with the correct candy name to score. Player who answers the most correct wins. Game sheets come two per page, answer sheet is included. 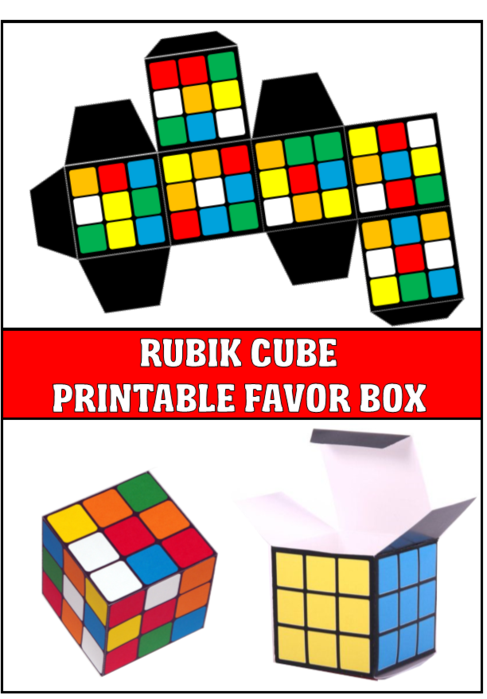 This game is ready to PRINT & PLAY for your upcoming 80's Party. The upside-down world is just like our world accept grosser and slimier - that is why a slime station would be a fun addition to the party. Slime is easy to make. Most people know of the recipe that calls for borax, but borax is toxic. Go to the link below for a slime recipe that is safe and fun. Measure the Elmer's glue into a bowl. Add a few drops of food coloring. Make it slightly darker than you want because the shaving cream will lighten the color. Now Mix in baking soda, next the shaving cream, finally add in contact lens solution and stir. The combination will start to come together. Take it out of the bowl and kneed well. The slime will be sticky, but the stickiness will lessen the more it is handled. Create a bike course through the neighborhood, with a few obstacles thrown in along the way such as cones. Set up an elimination style tournament and challenge players to race two at a time. Record everyone's time and award the winner an X-Men comic book. 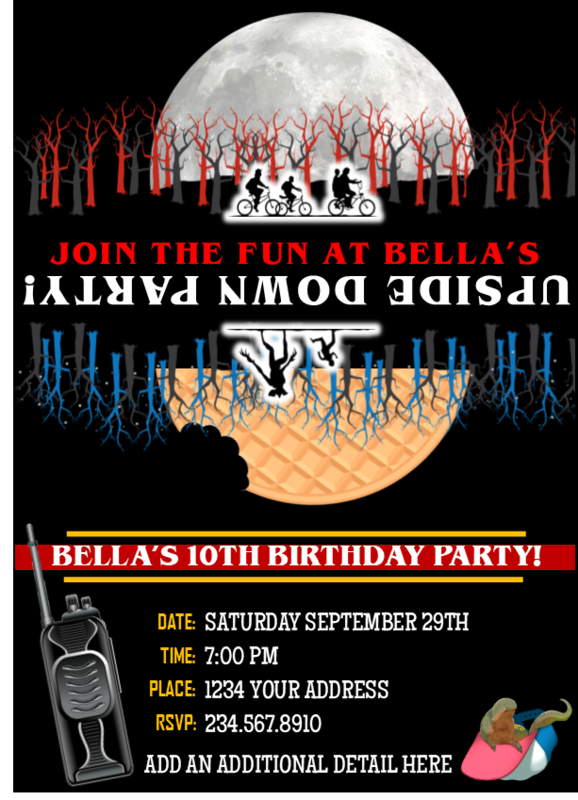 printable STRANGER THINGS PARTY supplies & invitations! 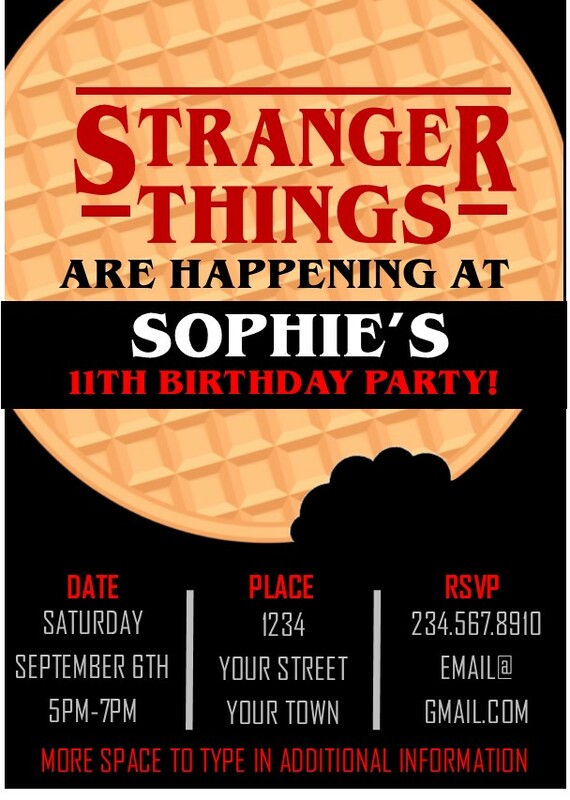 PRINTABLE STRANGER THINGS INVITATIONS - EDITABLE! 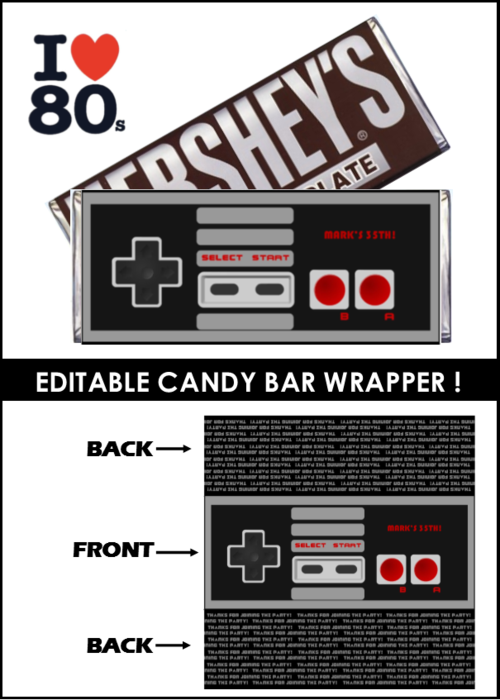 NINTENDO CONTROLLER CANDY BAR WRAPS! 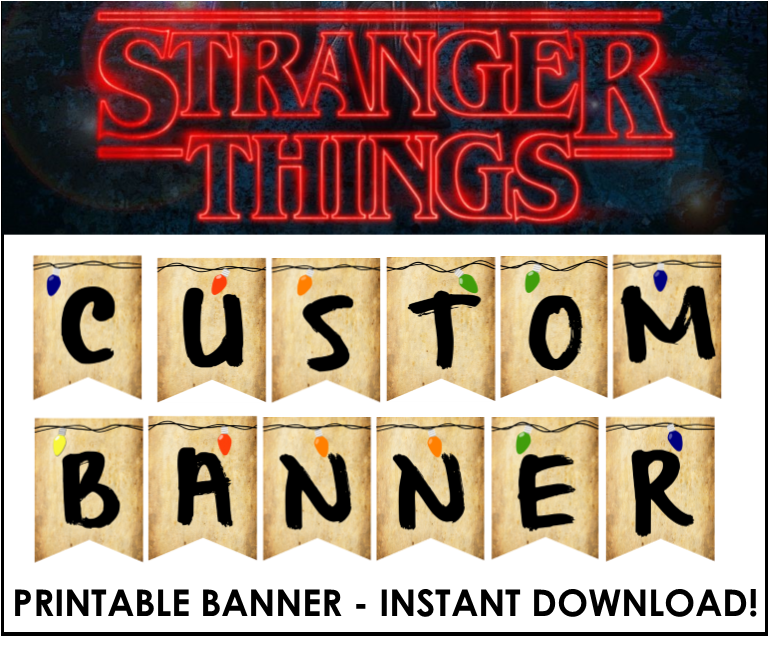 CUSTOMIZABLE STRANGER THINGS PARTY BANNER! 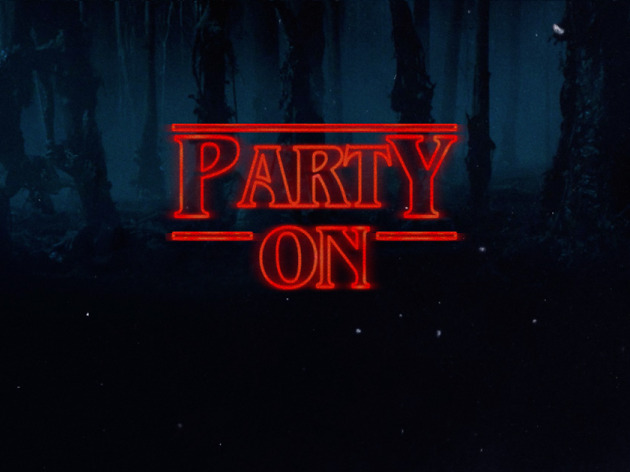 Stranger Things DIY Party vid! 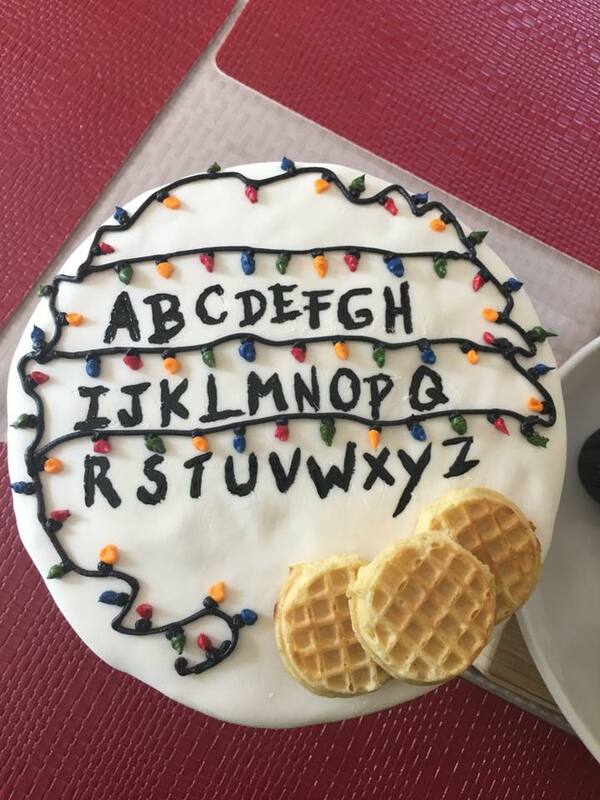 For even more Stranger Things party inspiration check out this awesome video I found on youtube! 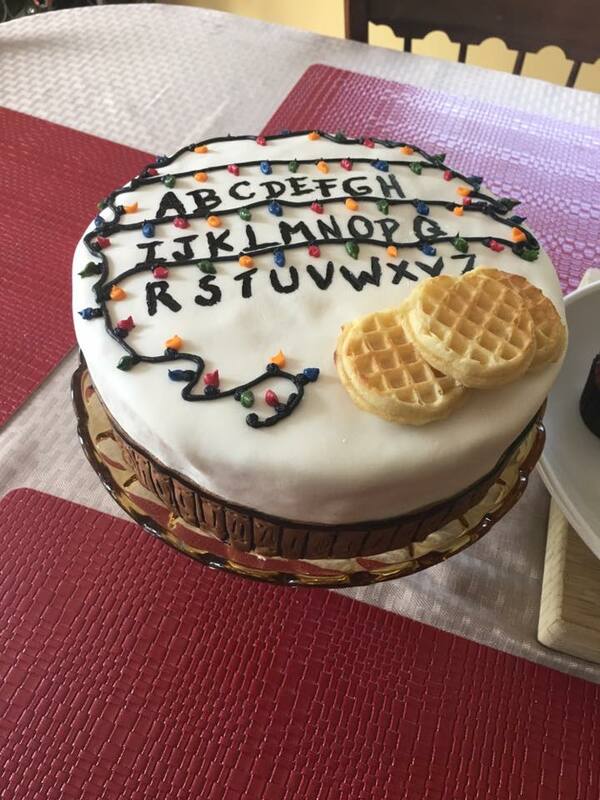 These amazing Stranger Things themed cake and cupcakes were created by my friend Jody Vititoe for her daughters 13th Birthday Party! 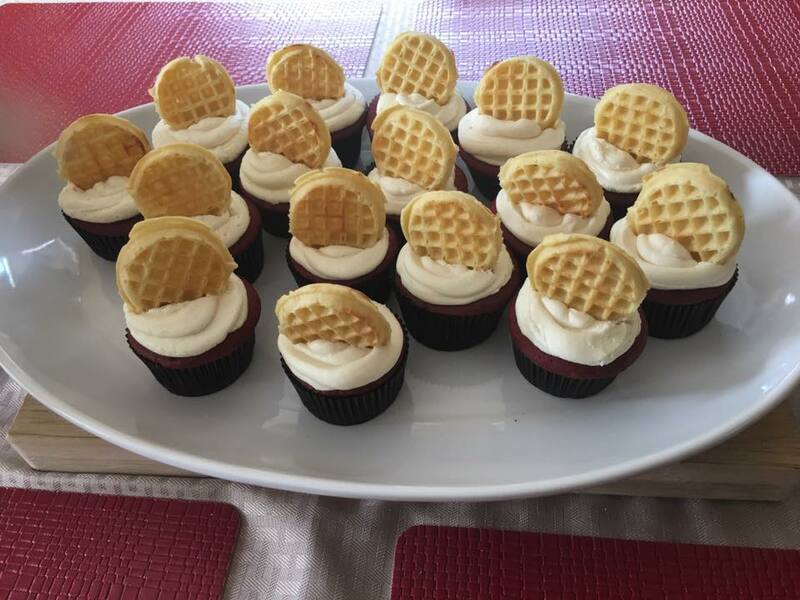 I love how she incorporated mini-waffles - Fantastic job Jody! see more cool party themes!